You push the monitor's on and off button repeatedly. You check the power cord. You know if you miss tomorrow's deadline, your job could be in JEOPARDY!!! Maybe you run a computer repair business or a tech store. And every day people keep coming to ask you to repair their LCD monitors, but every time you have to tell them to go somewhere else because that's not something you can do. I've repaired thousands of monitors over the years. In fact, it's very easy once you learn the basics. Still, the best part about this industry is the money. You know, I charge customers five times the cost of parts and labor to repair their LCD Monitors. Surprisingly, the reason why I can charge so much to fix a simple monitor is because people just don't take the time to learn how to do it themselves. They are intimidated... they claim they are not tech savvy... or they're downright lazy and would rather pay someone else a load of their hard-earned money so they don't have to. On the other hand, if you can spare some time to learn the basics of LCD monitor repair, you will be able to fix any monitor problem yourself. Be one of the lucky few who can make huge money repairing other people's LCDs. Well, let's just say there are over 100 million people in the world who own at least one LCD monitor. After their warranties are out, soon enough, their monitors will blow out. 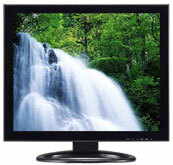 If you know how to repair LCD monitors, then you can easily charge $50 to $80 per monitor. For most, it takes on average just a few minutes to fix any monitor problem. Let's say only a fraction of the 100 million LCD monitor owners were your customers. Can you do the math? You can make some serious money! Now, do you think learning how to fix LCD monitors is worth the effort? Good. Because my course: "LCD Monitor Repair Made Easy" will teach you step-by-step how to fix LCD monitors from the comfort of your own home. High Definition Step-By-Step instructional videos guiding you all the way from the very basics to the most advanced LCD troubleshooting techniques. Complementary book full of instructions and illustrations with additional insight on LCD monitor repair. Easy disassembling instructions for all LCD monitor model types. Revealing the tricks and secrets of troubleshooting and fixing any LCD monitor in a few minutes. Exactly where to get any part needed... cheaply... so more money goes into your pocket after each repair. Introduction to the principles of Electronics. Electronic testing devices - digital multi meters, internal/external power supply, functions generators, Oscilloscope, LCR Meter. Passive and Active Matrix LCD Monitors, LCD Screens. Advanced Fringe Field Switching, Multi domain vertical alignment, Patterned Vertical Alignment and Advanced Super View. Repairing stuck and dead pixels, rippling patterns, power supply issues, dead pixels, low quality images, horizontal or vertical solid lines. Repairing monitor flickering, wild patters, colored screen (green pink red), dimming side and operating system problems. 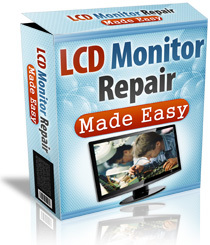 "LCD Monitor Repair Made Easy has been the best investment I've ever made!" "LCD Monitor Repair Made Easy has been the best investment I've ever made! I'm a primary school teacher by profession, so I have no background in electronics whatsoever. However, I'm always keen to learn new things, hence why I purchased your course. I was amazed at how easy it was to grasp the techniques involved in LCD monitor repair, and the videos did a fantastic job of showing exactly what and how to do it. So far I've attempted my new found skills on three LCD monitors (one wouldn't switch on, one was flickering like crazy, and one had vertical lines from top to bottom) and successfully fixed all of them in less than 15 minutes. I might consider doing this part-time, as I sure could use some extra money!" "The profit I'm making from LCD monitor repairs have became my top income source"
"I feel I owe you a thank you note... I've been running a small home business selling computers and computer parts, but never got into repair services as I didn't have time to attend classes (I run my business on my own, so I can't really afford to take time off). However, since the recession, computer sales have slowed down and at the same time more and more people have been coming to ask me to repair their computers (monitor problems being a main issue). So I started looking for "teach yourself" guides, and I stumbled across LCD Monitor Repair Made Easy. I read it from cover to cover and watched the videos, and started practicing on some old parts I had lying around. In about ten days I was confident enough to start accepting repair jobs from clients, and now I've been doing it for 2 months. Guess what, the profit I'm making from LCD monitor repairs have became my top income source...I just wish I had found your system earlier!! " "I've managed to repair an old faulty LCD monitor in 5 minutes"
"Bob, I'm an accountant working at a busy office and we literally call the tech guys every week because there is always something going wrong with the PCs. Monitors blowing out is a frequent occurrence, and generally we'd just buy new ones because we get asked $75+ for repairs. Well last week I saw the tech guys repair one in just a few minutes and I couldn't see how they could charge that insane amount of money for that! So I went online and started reading about what was involved in LCD monitor repair and came across your guide. I've very happy I got it as one week later I've managed to repair an old faulty LCD monitor in 5 minutes. Next time one goes black in the office, I'm gonna show the guys how it's done!" "After watching the videos I immediately figured out what had gone wrong"
"Great job with your repair program! I'm just an ordinary guy who likes getting his hands dirty and will attempt to fix whatever goes wrong in the house. I've thought myself (trial-and-error) how to fix loads of stuff but when my monitor when out, I didn't have any luck getting it to work again, even if I played around with it for a whole weekend. My frustration led me to your program and after watching the videos I immediately figured out what had gone wrong. After about 20 minutes my monitor was working again! I think monitor repair is a skill everyone should have, and your system makes this know-how accessible to all. Thank you. " "The videos are exceptional and the guides easy to follow"
"Hey mate, just a quick thank you email to show my appreciation for your LCD repair course. I was looking to enrol to distance learning courses on monitor repair, but they were all priced anywhere from a few hundreds to a few thousands. So I bought your course instead and I don't think that it can be any better. The videos are exceptional and the guides easy to follow. Kudos to you Bob!" "I earned my first fifty dollar repairing a monitor"
"Dear Mr. Lime, My son bought me LCD Monitor Repair Made Easy for my birthday two months ago and today I've just served my first official client! After seeing how easy, how quick, and for how cheaply LCDs can be repaired, I decided to try my luck starting a small part time repair venture (I work full time as a clerk). I order two hundred flyers advertising my services and last week distributed them around the neighbourhood. And today I earned my first fifty dollar repairing a monitor (my expenses were just $7)! I'm hoping that word will spread around and that I'll start getting more clients." " I can now repair LCD monitors!" As of last month I've added another trade to my repertoire - I can now repair LCD monitors! And I've learnt it all thank to your system. I got interested into it when our monitor went out and the computer technician told us how expensive the repair was going to be. Turns out he was trying to rip us off, because I just needed a small part which I got for a few dollars, and about 10 minutes of my time. Thank you Bob!" "The bible of LCD Monitor Repair"
"This LCD monitor system should be the bible of LCD Monitor Repair. I'm glad I got my hands on it and I hope that more and more people get to know about it, because it is amazing at how much money people are wasting taking their monitors to repair stores. If only people knew that all it takes in most cases is a few minutes and a few dollars of parts! I came across your system after my monitor went purple and I started looking for solutions online. I read people praising your system on a DIY forum and decided to give it a try. I'm a very happy customer and I can tell you that your course is worth its weight in gold"
Now, I guess you're wondering how much LCD Monitor Repair Made Easy is going to cost you? Just how much money do you need to invest in order to learn LCD monitor repair? First of all, let me tell you that the investment isn't going to cost you nearly the amount you think. Why? Because, I've been in your shoes before. I've been... frustrated and desperate... looking for a cash-pulling opportunity... that didn't cost a fortune. So, why wait? Save some change and order now! To add to this incredible deal, your order is backed by a 100% Risk-Free, 60-Day Guarantee. If you follow the exact steps listed in LCD Monitor Repair Made Easy, and within 60 days all your LCD monitor problems aren't eliminated, then simply email me for a refund. No Questions... No Hassles... No Problems... Just your satisfaction - guaranteed! Order LCD Monitor Repair Made Easy Now! You are about to get instant access to this best selling product even if it's 3 in the morning. LCD Monitor Repair Made Easy will show you exactly how to repair LCD monitors at home: with the help of step-by-step guides and videos. LCD Monitor Repair Made Easy is in digital format (PDF & Video) which means there is no need to wait for it to arrive. You'll be get started in just minutes from now. P.S. : Now that you know how to fix LCD Monitors, you'll get plenty of customers needing your repair services, which aren't cheap. Click Here to Order Now! P.P.S. : Remember, the special price of $37 is limited for a very short time only. You are also backed by a 100% money back guarantee so you have nothing to lose!